The Atlas mountains are, at first look, forbidding and hostile. The weather conditions are changeable and the environment inhospitable to people, animals and vegetation. Over the duration of the two-week expedition the team got to know the people, the terrain and learned much about the Berber culture and rural way of life in the remote hamlets and the cosmopolitan and Maghrebian metropolis of Marrakech. 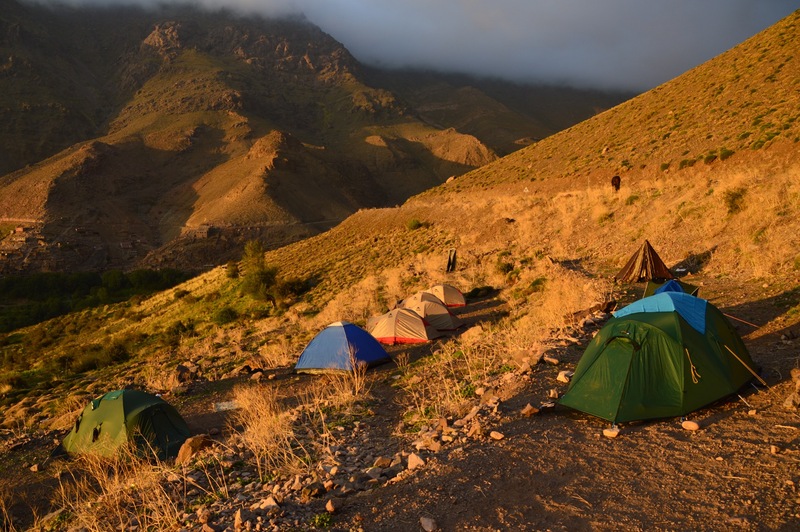 The expedition leader took his team of twelve from a variety of Royal Signals units for an eleven-day trek through the Toubkal region of the Atlas Mountains. The team was made up made up of three regulars and nine reservists. After pre-deployment preparation that included country security and medical briefs, kit issue, and essential lessons on the Summer Mountaineering Foundation course, we were off to the airport. On the first day of the trek we met the guide from Tourdust who introduced us to the group of Moroccan military personnel who would be accompanying us through the hills. We sat and took tea with the team leaders whilst conversing with the Police Chief of Imlil who was very keen that we would have a safe and incident-free trip. Little did we know that we would be seeing more of him and sooner than expected. 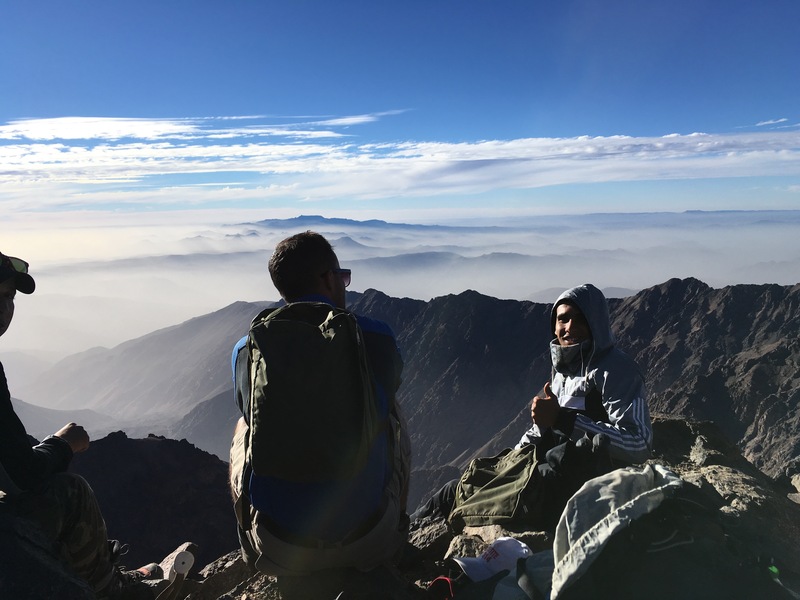 The first seven days consisted of trekking through villages and valleys over high passes and through forests, acclimatising as we went in preparation for the final event – summiting Toubkal, at 4167m the highest mountain in North Africa. Each evening our guide Ibrahim would identify a camping spot and we would pop up our trusty Terra Nova tents, rest our weary feet and eat like kings. Afterwards would come interrogation from the Mountain Leaders on route selection, medical contingency planning, and weather or navigation. Our days were filled with the contrast of fiercely hot dust on the trail and the cool verdant mountain valley villages with the ubiquitous Morrocan walnut and apple trees heavy-laden with ripe fruit. The Tyrannosaurus-like bray of the mules that echoed about the rocky cliffs, the joy of finely diced fresh tomatoes and cucumbers at lunch, and the refreshing sweetness of Moroccan mint tea at rest stops are happy memories. The monotonous reliability of Harissa soup to start every evening meal without fail, not so much! 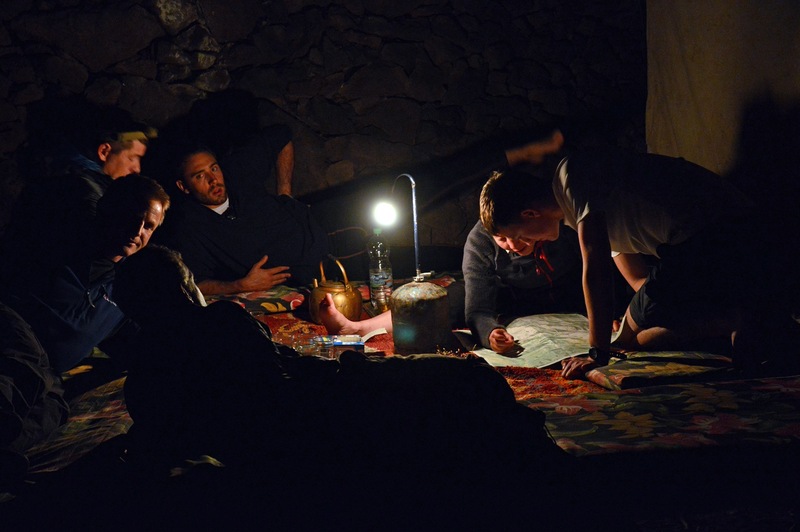 On the fifth night, the expedition leader surprised the group with the ‘treat’ of sleeping in a hostel in the village of Tizgui. That night we dined on steamed goat which had been specially selected for us as we had trekked past a herd earlier that day. One of the team had thought it was a joke when he had been asked to choose an animal that he liked the look of… We all indulged in either a capricious boiling hot/freezing cold shower or the local hammam: which was essentially a sweaty hot box of a room that four naked men could huddle together in and pour scalding water over each other. Then the entertainment began, in two different ways. First the Moroccans introduced us to the delights of the local music which was powerful and thrummed with passion and purpose to the tune of an infectious drum beat and the haunting vocals from an unprepossessing wrinkled old man. A man, who until the music began, had been sitting unassuming and unnoticed in the corner of the room. But secondly, team members started to get ill; three went down in the night with dodgy tums and fevers. This led to a split in the team with some headed to Marrakech for medical treatment (via the Imlil Police Chief) and the rest on schedule and still on trekking. Summiting without the rest of the group seemed wrong and we wanted to optimise everyone’s chances of getting to the top; so the decision was made to regroup in Imlil two days later and trek up to the Toubkal refuge from there. Three members made a quick trip to Marrakech military hospital where they took advantage of the clean sheets and excellent medical care. 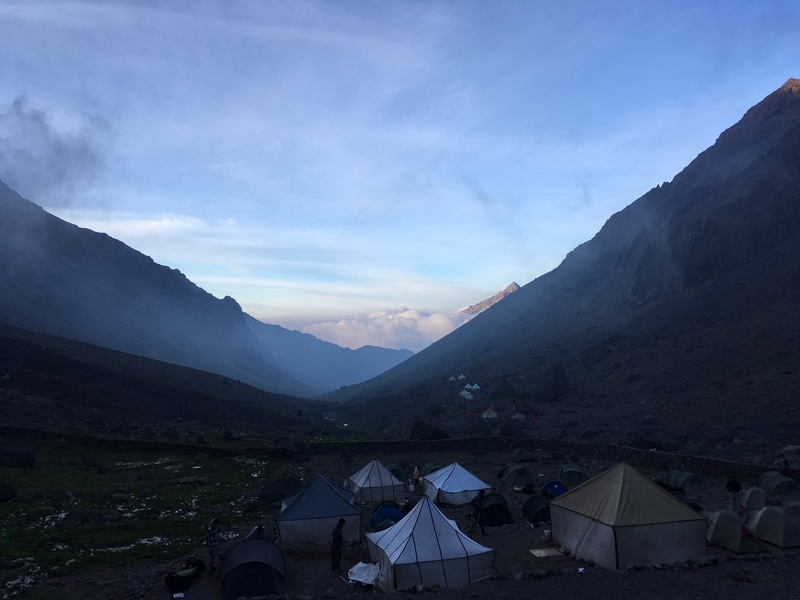 Much to their credit they made it up to the Toubkal Mountain refuge on foot a day later to meet the rest of the group and the team was re-united. Summit day: We had a four am wake up call, fuelled up on pancakes and processed cheese, then picked our careful way up and over the steep rocky terrain in the darkness at 3200 m. Watching the bobbling trail of head torches flickering in front and behind in the cold and icy clear, the dawn glow of the sun lit up the mountain ridges as we steadily gained altitude; breathless, sweaty and determined. Out of 12 climbers 10 summited successfully and all were deeply satisfied at what they’d achieved. 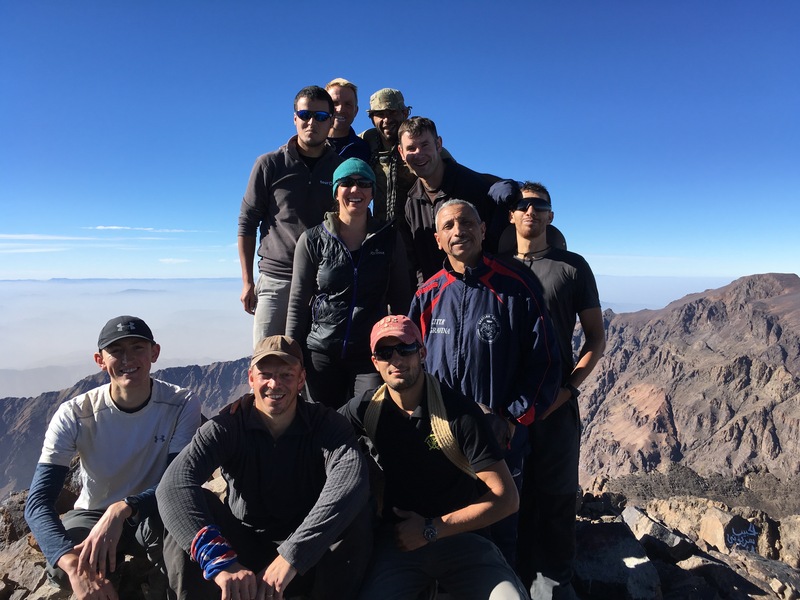 Eleven days of hiking and camping together as a Moroccan/UK and Regular/Reserve team built strong bonds between team members and improved soldiers’ understanding of Morocco and of the social nature of Islamic culture. It was an invaluable exercise that developed soldiers’ leadership, unit cohesion and personal resilience. To stand on the summit together, against adversity, having met challenges and overcome them, helps form the bonds between soldiers that form the essence of military comradeship. Many thanks go to the Ulysses Trust for supporting this trek, a challenging eleven day Moroccan and UK military joint expedition in the Atlas Mountains that resulted in a strong summit day performance for the team and good passes all participants in the Summer Mountaineering Foundation (SMF) course.